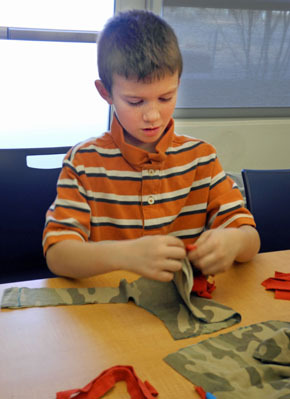 Isaac Delong crafts a Mohawk hat out of a recycled t-shirt Tuesday at the Artesia Public Library. The event was the second of six Recycled Workshops sponsored by the library and the Artesia Historical Museum. The next is scheduled for Tuesday, Jan. 26, and will allow teens and adults to make fashion accessories out of recycled vinyl records. Nancy Dunn, museum manager, would like to thank Mary Ellen Self, owner of A Cowgirl’s Closet, for donating several dozen t-shirts for the Recycled Workshops.